This day was so full, I hardly know where to begin. I guess I'll just begin with the beginning. We had to get up around 6am. We had a bit of a walk to where we'd be picked up for our day trip. Premium Tours gave us the nearest hotel to our apartment to meet us, so we wearily got ready and started walking, eating our fresh market focaccia bread and cheese from the day before. We arrived about twenty minutes early on purpose, to make sure we made no stupid mistakes by getting lost or being late and somehow missing our trip! The hotel graciously opened up their little cafe a bit early to get some caffeine in our veins. Once the bus arrived, the hotel provided us with little to-go cups and we followed our driver out to our ride! We were the first ones on (there were only four of us at this point), and we scored the awesome seats behind the side exit door, with extra leg room and cup holders! It felt like choir tour all over again. We soon found out that our driver was named Marcello ("mar-che-lo"), and was French. (feigning outrage that it took the group so long to get to the pub in Lacock). He announced that the bus company had certain rules about eating and drinking on the "coach", and that other than bottled water, we were not allowed to have anything else on the bus. Dusty and I guiltily looked at our Costa Coffee to-go cups, snuggled in their cup holders. "So," he finished, "They say no eating, but I don't give a sheet." Off to a great start with Marcello and our fancy coach, we drove steadily along and picked up the rest of the passengers at each stop. Our guide was named...Syl? Sarah? Sal? The accents were too thick to decipher and she only mentioned her name the one time, and I felt too weird asking her upfront. She was quite the character. 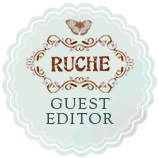 She was extremely knowledgeable and really helpful. She had dark curly hair and strong features, with big eyes and a stocky build. She had a kind look to her. At some point in every single one of her stories, she would start a sentence raising her eyebrows and seeming to speak out of the side of her mouth, saying in her British accent, "Dare I say..."
"Dare I say, it had something to do with the taxes that year..."
"Dare I say, that was before he was married..."
"Dare I say, it was a classic example of royal behavior..."
Even the drive to our destinations was really fascinating. We passed by Alfred Hitchcock's house in London, and then further along, we spotted the Magna Carta Memorial where the actual document was signed! Our first official stop on the tour was Windsor, you know, the Queen's preferred weekend home. Home. Castle. Meh, what's the difference. When we first got off the bus, we began to walk through the town toward Windsor Castle as the church bells began to chime their classic Sunday bell song. Syl-arah-al had exclaimed, "Oh wonderful, mother is at home!" The flag was up, proclaiming to all of us (after "mother" was explained to mean the Queen of England) that the Queen was in and wanted to meet me personally. Unfortunately, I was far too busy. The view with the castle behind us - the building on the right (and below) is the church. Pictures were strictly forbidden within the castle walls. So naturally, Dusty Iron-Manned the camera and took a few anyway. It was a beautiful day, but much colder and windier than the last. We were happy to be bundled up and layered! But even so, that clip in my hair was definitely gone by the end of the day. It refused to put up with any more wind torture. Even with the bitter cold, signs of spring were showing their defiance. Blooms were sprouting about, and little bits of color were fighting the good fight. These are lanterns. Royal lanterns. I wanted to take the crown as a souvenir. After the tour, which was wonderful, we had a few minutes before we had to be back on the bus. And thank goodness, because I met this guy. I'm so glad he was young and afraid of my coral pants and really intense personality. I'm not sure why I got so boisterous but I hopped and skipped over to him and practically yelled, "ELLO!" The only thing that was missing from my outburst was a "Govnah!" But anyway...I'm glad, because I got him to laugh. No...obviously not really laugh, he may be like 14 years old but he's still trained. It was all through his nose. And it was just for me to hear, and it was completely satisfying. We happily continued our skipping and hopping attitude but had to skip buying a snack to make it back to the bus on time. It was a bit of a drive, so we slept. On a side note, this day trip was amazing, because there was so much driving/sleeping time in between all the sight seeing...it gave us a chance to recover from some of our jet lag, without wasting a day! Waking up to Stonehenge on the horizon was not a bad way to join the conscious world. They're big stones, huge, arranged in a strange circle full of dark and intense mystery. I have to say that standing before them was somehow more impactful than I expected. I felt like...Brave. Or maybe Braveheart, although that doesn't make any sense at all. But going to places like this really does just inhabit some kind of unique feeling that can only be described as wonder, and exhilaration. It's like when you stare at the night sky for too long, when the stars are really bright and everything's clear and the sky is that deep royal blue...what is that feeling? Longing, maybe? Realization that we're so small in comparison to the rest of the universe? ..what? Is that just me? In other news, I had never before been so brutally attacked by cold and wind before. It must have been the strange spiritual presence of Stonehenge. Or maybe just the weather, but either way, I was cold and icy and my face felt like it was going to start breaking off piece by piece. Me: Am I smiling? I can't tell if my face is moving. Even with the wind, it was a really cool experience. I wanted to both run back to the warm bus, and stay way longer than allowed because I couldn't stop staring. This is when the hair clip started getting really aggravated. The area around Stonehenge is beautiful - bright green fields that stretch for miles. Dusty and I have a big inside joke about sheep, since I would always make such a big deal about them whenever I'd see them in Ireland. "Sheeeeeeep!" We regretfully pulled our faces away from Stonehenge when it was time to go back to the bus. Confession: we ran, we screamed in windy pain, to get back to the bus as quickly as possible after grabbing any hot drink we could manage to pronounce with our frozen lips from the tiny coffee stand. The drive continued to be beautiful as we headed to our lunch location, the village of Lacock. Harry Potter and Mr. Darcy. I don't know where you all stand with those two publications and/or films...Harry Potter and Pride and Prejudice...but for right now, you love them. So pardon the oncoming nerd talk. We arrived in the cute little village, and suddenly my worst fear was realized. We were only stopping for lunch -- like 45 minutes -- with absolutely no time for sight seeing. The whole time I had been planning and preparing to go see Lacock Abbey, which had been used in filming The Sorcerer's Stone. And it's just a cool Abbey, all around. So because my husband loves me a lot, he waltzed straight up to Syl-arah-al and asked her boldly if we could skip out on lunch entirely to go tour the Abbey. He promised we'd be back to the bus at whatever time she indicated. She immediately recognized us as Harry Potter fans, but even more than that, there was a twinkle in her eye that translated into a love and respect for the adventurous soul. She even jovially promised to have the pub wrap up two tasty fish and chip meals for us. We followed the rest of the group to the pub so we'd know where it was. 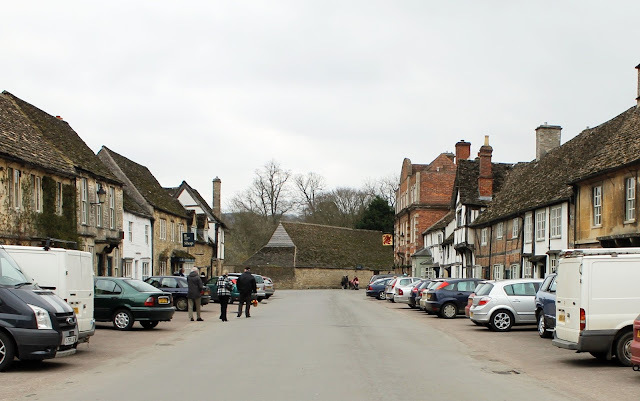 Lacock is the cutest little village of all time. Fun fact: one of the reasons it has been favored in the movie making biz is because there is no electricity, so there are no electrical wires snaking through the air. 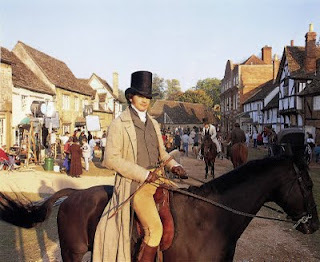 It makes it really easy to transform the village for period-sensitive entertainment. The village of Lacock was used in Pride and Prejudice (BBC), Emma, and Harry Potter in both The Sorcerer's Stone and The Half-Blood Prince. Harry Fact: That house in the dead center, in the back? Belongs to Lily and James Potter! The clip and I had had a weary conversation, and it jumped ship. Once the rest of the group went into the pub, we ran away. We had limited time, so we ran for at least 37 seconds before we realized we were out of shape. The Abbey is really quite extraordinary. So is that wicked tree. Why yes, I think that is a unicorn in there. but if it was some kind of art display, at least it fit the mood. I spy a Gryffindor scarf. I think I'll get this printed on a ginormous canvas. Lacock Abbey is Hogwarts central. 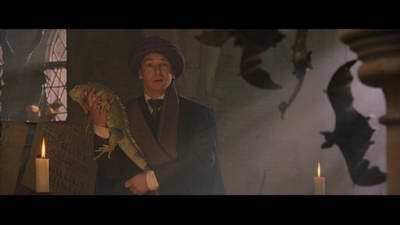 In the first movie it was used for housing The Mirror of Erised, Professor Quirrell's classroom, and Snape's Potions classroom, and the cloisters were used for various scenes in the first and second movies. The village of Lacock was also used in a few of the movies including The Half-Blood Prince for Slughorn's house (we passed by it! Lovely big brick house), in the Sorcerer's Stone for the Potter house like I said before (when Hagrid explains to Harry what happened to his parents), and other various village scenes. But back to the Abbey - the cloisters are really beautiful! Once we began entering the grand high-ceiling rooms, we could see every other detail fall into place in our minds to transform the space into the Hogwarts classrooms. Let us take a tour. Many mistake this room as the Potion classroom, because of the giant cauldron in the center of it. 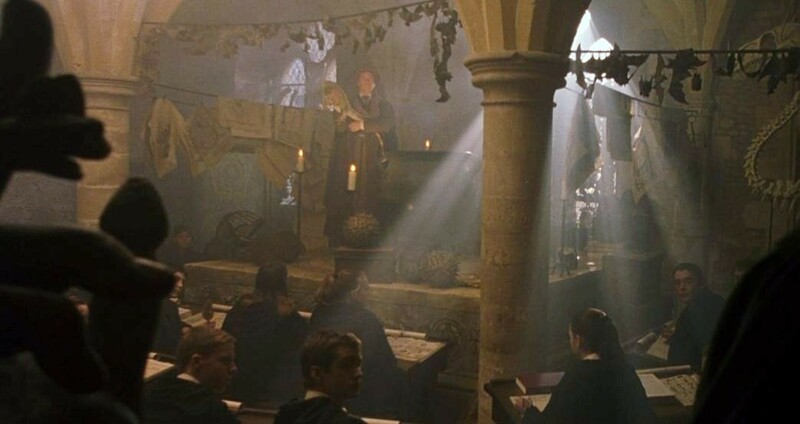 However, the cauldron is not related to Harry Potter (even though I believe it's featured in the movie, in Quirrell's classroom, though briefly shown), but it has actually been in the Abbey's Warming Room for hundreds of years. 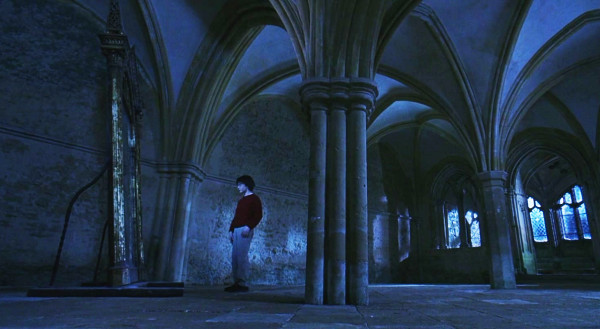 The mesmerizing cloisters outside of Quirrell's classroom are where Wood was summoned by McGonagall so Harry could officially be invited to be Seeker for the Gryffindor Quidditch team. For all you non-Harry lovers, this may as well be German to you. 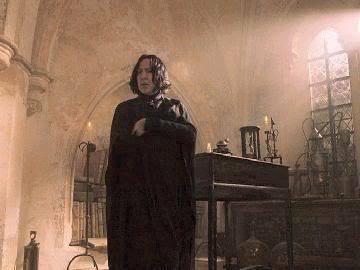 It also serves as the hallway where Harry hears the basilisk for the first time, after his time with Professor Lockhart in detention in the second movie, Chamber of Secrets. I may have just made you all fall asleep, but I found it completely amazing. Sometimes the most beautiful places in the world are only revealed to us through our favorite movies and beautiful sets, and it becomes even more exhilarating to experience not just one world, but two, both reality and make believe brought together in these historical places. We were running out of time, so we did a quick sprint through the inside of the Abbey as well. We said a sad farewell, but knew there would be fish and chips waiting for us - not to mention a chance to walk among the main street used in the BBC version of Pride and Prejudice, and Emma. Overall I think we would both say that our excursion away from the group was totally worth it. I don't think I could have been so close to the Abbey without actually getting to see it. I hope we'll be able to visit England again, as there are so many sights to see. But we really wanted to make this trip count, nonetheless. 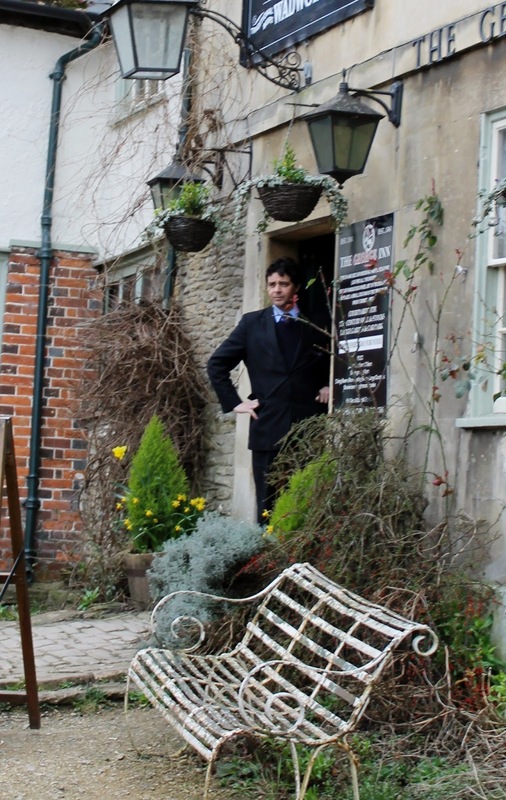 We went back to the George Inn, and hopped in for a peek at the historic pub. And the weird part was, it was turned by a dog! There was a legitimate breed of dog (the "turnspit" dog) that would be trained to turn the wheel over the flames. Marcello made a joke that the owner claimed that this was the source of the original "hot dog". Afterwards, we turned the corner and went down the street a little ways to catch a glimpse of the "main street" of Lacock village. The pub was down the left, and our meeting spot was at the red telephone booth to the right. I can't explain the love I have for the dashing Mr. Darcy. AKA Colin Firth, who was the best of them, to be sure. It was really fun to walk this street. Now I must go home and watch this immediately. Last, but not least, (yes, that's right, this post will eventually come to an end!) was the city of Bath. When we originally started planning trips, we knew we for sure wanted to go to both Stonehenge and Bath. Our plans began to shift when we realized all of the other options available to us! And we obviously landed on a trip that included Windsor and Lacock as well. Which I would highly recommend. We had another breathtaking drive, one that reminded us a lot of the rolling green landscapes of Ireland. When we arrived in Bath it was early evening, and we were definitely ready to eat our fish and chips! As we drove into the huge city, we passed by the place where Jane Austen had lived during her time in Bath. The rest of the town was just as stunning. Such a cool city. We got off the bus and were told our return time. We didn't have a lot of time, and first on my list was to see the Jane Austen center! But first we had to take some time to soak up all the sights. And also, we had to eat our food! We were starving! Right next to this amazing cathedral were the famous Roman Baths. We decided not to spend the time or money exploring them, but it was a pretty cool structure! Eating our fish and chips outside of a cafe - kind of amazing. It was quite a walk to the Jane Austen center, and we were crossing our fingers that it was still open! They have a tea house in the upstairs part, and I was dying to go. They have things like "Champagne Tea with Mr. Darcy", "Tea with the Austens", "The Dashwood's Tea", and "Mr Bennet's Rich Tasty Toasties". Good Lord, I belong there. But it was closing in on 5pm, and my heart told me it would already be closing down for the day...but we went anyway, just to be sure. Sure enough, the elderly man in costume (yes, he's real, unlike the Jane statue) informed us that the Centre was closing in two minutes and the tea room had closed long ago. Hiding my pout, I posed with miss Austen in good spirits. Even so, the rest of Bath was really fun to explore! There seemed to be so many fun little alleyways and corners and shops. We had been seeing/hearing about the "Pasty" since arriving in England, so we decided to go for it and stop at this pirate pad. Pasty = British Hot Pocket. So naturally, it's way, way better than the American Hot Pocket. It's flaky and warm and buttery and packed full with delicious meats and potatoes and who knows what else. For the inner-high-schooler of my hot-pocket-loving husband (no shame), this was a dream come true. The rest of our time in Bath was spent walking around, trying the best and creamiest fudge on the entire planet (Fudge Kitchen - near the Cathedral - go there), and ducking into various buildings to survive the windy cold. It even started to snow a tiny bit, when we were getting ready to get back onto the bus! I think I would definitely go back to Bath. There's so much to see and so much to explore. But for now, it was enough. Sightseeing this way was definitely a sprint, but when you're only here for a short time I think it's worth it. You may not get that "quality" visit for each place, a full plate, but you get a taste of each delicacy, and sometimes that's the best way to eat a meal. On our way home, we pretty much slept the entire way. When we were getting closer Syl-arah-al came down the isles asking everyone where they would like to be dropped off. We chose a metro stop, so we could easily get home or go back to the Strand, the area where we ate dinner with Rachel the night before. When we informed Syl-arah-al of our plans to go back to the Strand, she seemed surprised that we were already so familiar with the areas around London, particularly the metro. That twinkle came back in her eye, and she smirked, "I should have known, since you two are the adventurous kind." Coming from her, somehow, it was the best compliment we'd ever received. Our last stop for the day was a little pub called Shakespeare right next to Victoria Station. We ended up not going to Strand, since we weren't terribly hungry and were somehow still tired, despite all of our naps. I got a simple "broccoli and cheese" soup (it was definitely just pea soup) and Dusty had the extraordinary luck to order a "Mozzarella Burger" which was...well, also just peas. It was a veggie concoction, but mostly it was just a fried patty of peas. I can't explain why peas are so important to London, but I'm fine with it. I happen to love peas. But even so, I would much rather have a cow burger than a pea burger. I think Dusty agreed with me. We had another day of exploring ahead of us, our last in London. i am SO enjoying your posts :) but when you and dusty come back to AZ (for a visit or for good) let's go eat at Cornish Pasty Co in Tempe! You will die! SO GOOD!